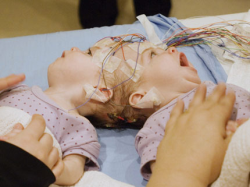 Conjoined twins are an incredibly rare and intriguing phenomenon. They are always identical and monoamniotic-monochorionic, (sharing the same amnion and chorion). Identical twins happen when one fertalized egg spontaneously splits into two identical halves. So, this type of twinning is thought to occur because of an extremely late split, one that does not completely separate into individual fetuses. The result is a set of twins who will have skin and even internal organs that are fused together. The variation can go to extremes, from easily operable to life threatening. It is hard to imagine being attached to another person in this way. Under these circumstances, only 1 in approximately 100,000 to 200,000 births are actually born alive. About 50% are stillborn. Statistics imply that 35% born alive will survive only 24 hours. Interestingly, males are more likely to become attached, but females are more likely to be born alive (females make up 70% of this type of twinning). 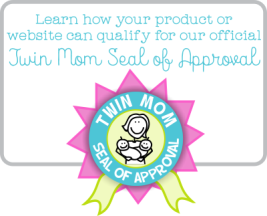 There's several different ways that twins can be conjoined. However, they can be categorized into a few types. The most common type is known as thoracopagus twins. These twins are connected at the upper portion of thier torsos. Another classification is called thoracopagus, in which case twins share a heart. It is practically impossible to separate them and have them both survive because of how closely they are joined. Approximately 40% of twins who are conjoined fall into this category. The next most common type, making up about 33% of cases, is known as omphalopagus. In this type of conjunction twins are joined from breastbone to waist. They almost never share a heart, but might share a liver, gastrointestinal or genitourinary functions depending on their unique body structure. Lastly, the rarest type of conjoined twinning is craniophagus twins. These twins are joined at the head (cranium). Making up only 2%, they are truly uncommon. The first set to garner international fame were Chang and Eng Bunker (See photo right). They were born in Thailand in 1811 (which was known as Siam at the time), though both of their parents were of mixed Chinese heritage. 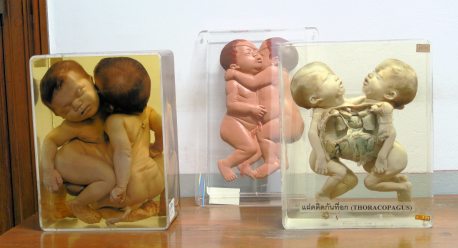 It is because of their roots that the term "Siamese Twins" was born. Although, the term is rarely used today and is now considered quite inappropriate. The Bunker brothers were only joined by a small piece of cartilage at the sternum and were otherwise totally independent bodies. Ironically, this type of conjoining could be taken care of easily today with simple separation surgery given current technology. Perhaps the most endearing and spirited known today are Abby and Brittany Hensel. These two have been featured on television several times and their story is truly inspiring. 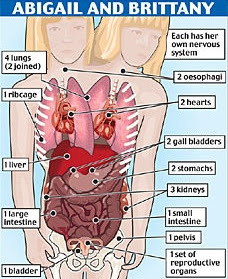 Though they are two completely different people with their own unique personalities, they share much of their anatomy (See Diagram). The thing that is most memorable about them is how they have led such normal lives under the circumstances. They are fun to watch and are the only surviving set of this particular type of twinning in current times. Of course, there are other types of conjoined twins who have been around much longer and still those being born today who will go on to lead happy, meaningful lives as well...just without all the media attention. So, what could be even rarer than this type of twinning? It's a phenomenon known as Fetus in Fetu or a Parasitic Twin.